How would you celebrate your 50th anniversary? One of the ways the Church of Jesus Christ in Madagascar (FJKM), a partner church of the Presbyterian Church (U.S.A.), celebrated its 50th anniversary recently was by promoting free HIV testing at all of its commemorative events. FJKM President Irako Andriamahazosoa Ammi was tested publicly during a weeklong celebration in Toamasina. According to the organization UNAIDS, “The global AIDS response is at a precarious point — partial success in saving lives and stopping new HIV infections is giving way to complacency.” The FJKM, however, has not given in to complacency, despite a political crisis and reduced funding. Although the HIV rate in Madagascar is less than 3 percent, the risk factors for an epidemic remain high: a high poverty rate, high mobility from one part of the island to the other and a high rate of sexually transmitted diseases. The FJKM began fighting the spread of HIV and AIDS in 2002, creating a permanent National AIDS Committee in 2007. 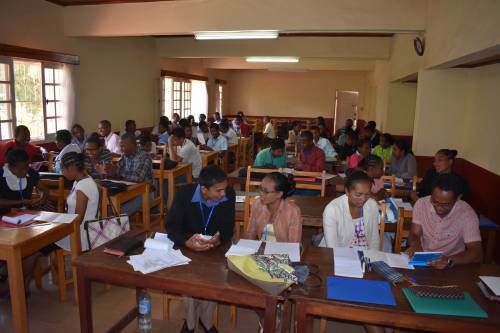 The committee brings together church branches, along with representatives of FJKM schools, synods and seminaries, to create an integrated fight against the spread of HIV and AIDS in Madagascar. The PC(USA) has been offering technical assistance to the FJKM since it began its fight against AIDS. In 2004, training sessions were carried out in all 36 FJKM synods. Churches were encouraged to share information about HIV and AIDS for five minutes every Sunday. The FJKM AIDS Committee has produced many materials to help educate the population about HIV and AIDS. These materials have included sample sermons that pastors can use to talk about AIDS, educational flyers about HIV and AIDS as well as other sexually-transmitted diseases and a booklet on HIV counseling. One important strategy for the FJKM has been training pastoral students about HIV and AIDS: prevention and transmission, assessment of community risk factors, HIV testing and treatment, how to fight discrimination against those living with HIV and their families, and how to counsel those living with HIV and their families. Why train pastors and pastoral students? In a country where the educational level is low and most rural people have little access to news and the internet, pastors are among the most educated and respected members of their communities. It is important that pastors understand the basics about HIV and AIDS. They are then well-placed to help their congregations and communities reduce the spread of HIV and AIDS and to fight discrimination. The PC(USA) has been a faithful supporter of the FJKM AIDS Committee, helping to fund pastoral training, the production of educational materials and HIV testing events. Gracious God, thank you for enabling us to serve you through partnerships throughout the world. Guide us as we serve in Jesus’ name. Amen.